This South American shrub is winter dormant so is not frost affected. It grows readily enough in shade as well as sun though inclined to be a messy shape in shade. It has pretty lavender blue flowers in autumn. The flowers are a little larger than flocculosa and the young flowering stems whiter and buds whiter. It can be pruned to shape probably any season. 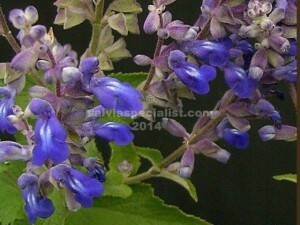 Similar plants are keerlii and flocculosa which are both in stock.